In 2012, BoatTrader.com drew 23.6 million unique monthly visitors, a 46 percent increase from 2011. 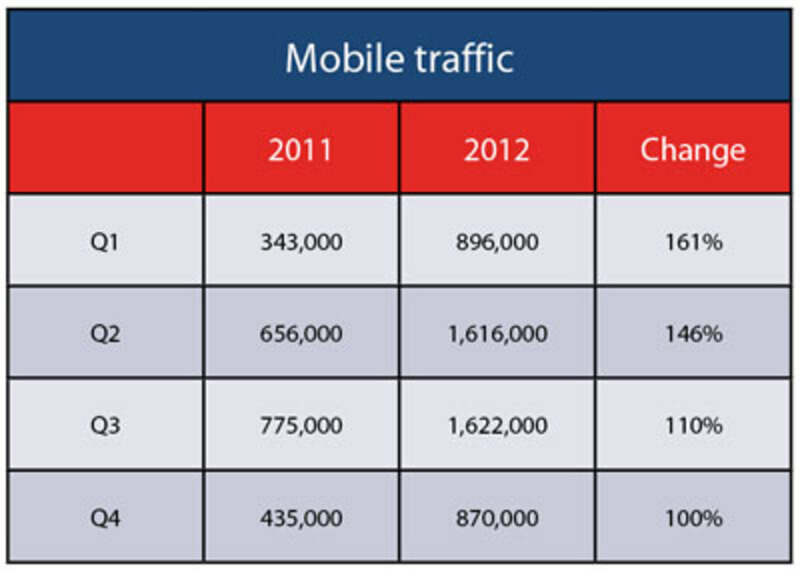 The lion’s share of the increase was attributable to rapid growth in the number of visitors who used mobile devices. As a percentage of total traffic to Boat Trader, mobile unique visitors grew from 19 percent in the first quarter to 26 percent in the fourth. In the first and fourth quarters, the seasonally slower parts of the year, close to 900,000 unique visitors reached BoatTrader.com from smartphones and tablets. During the second and third quarters, the number grew to more than 1.6 million. The rate of mobile traffic growth in the first quarter was 161 percent, a rate that slowed to 100 percent by the fourth quarter. In the first three quarters, unique visitors to Boat Trader from non-mobile platforms also increased, growing by 140,000 to 260,000 per quarter. In the fourth quarter that changed, and although mobile traffic was up by 425,000, total traffic was only 305,000 higher, indicating a drop in visits from traditional desktop and laptop computers.